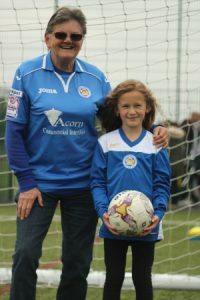 Leicester City Ladies Under 12s opened their league campaign in style with a 14-0 win against Oadby Owls. Leicester City Ladies played some great football throughout the game and showed their quality in front of goal. Credit to Oadby Owls who played with spirit and passion and never gave up. (3), Ella (3) and Jade (6). After the previous weeks game between Leicester City Ladies and Rugby Town both teams expected goals and another five were scored in this match and it could have been more. The fist half started well for Leicester City Ladies with Jenna, Natasha & Shelby combining well up front. It wasn’t long before Leicester City Ladies took the lead as Jenna crossed from the right and Shelby got the chance to put the ball in the net. With Jodie, Beth and Keely defending well for Leicester City Ladies the girls pushed forward in search of a second goal, but despite creating numerous chances a second goal would not come. The second half started with Rugby Town pushing for an equaliser and they got it soon after the restart. Rugby Town continued to put the Leicester City Ladies defence under a lot of pressure and they scored a second goal to go 2-1 up. Leicester City Ladies then started to push forward with Eleni and Beth breaking up the Rugby Town attacks and feeding the wide players. Natasha broke down the left for Leicester City Ladies evading a couple of tackles before crossing to Olivia who scored from just inside the penalty area to level the match. Both teams went in search of a winner. Leicester City Ladies attacked down the right with Emily beating two players before being crowded out as she was about to shoot. Rugby Town then broke quickly and a cross into the box found its way into the net. With time running out Leicester City Ladies went on the attack and created some good chances but saw their efforts clear the bar and go wide of the goal. Another good performance from this new Leicester City Ladies team, who are still learning to play as a team. Leicester City Ladies Player of the match: Jenna improving with every game. Leicester City Ladies made it four games unbeaten in the league with a win over Northampton Town. Leicester City Ladies as the home team were one up inside three minutes when a fine footballing move was finished by Gemma Ball. City had numerous chances and brave Northampton Town defending kept the Leicester lead to a single goal. Eventually Katie Bateman broke though the defence on twenty five minutes, she timed her run superbly to get on the end of a fine pass from Helen Rudkin and rounded the keeper to score. Leicester City Ladies were a bit patched up through injury but the changes seemed to click. In the second half Leicester City Ladies made it hard for themselves getting involved in a cup tie type game. Leicester City Ladies stood firm and gained control of the game again late on and were unlucky to not add another to the score sheet, with Laura Toon’s effort going the closest to making the game further beyond Northampton Town. Leicester City Ladies first team coach Andy Marsden led a training session for an enthusiastic group of 26 young Brownies and their leaders. 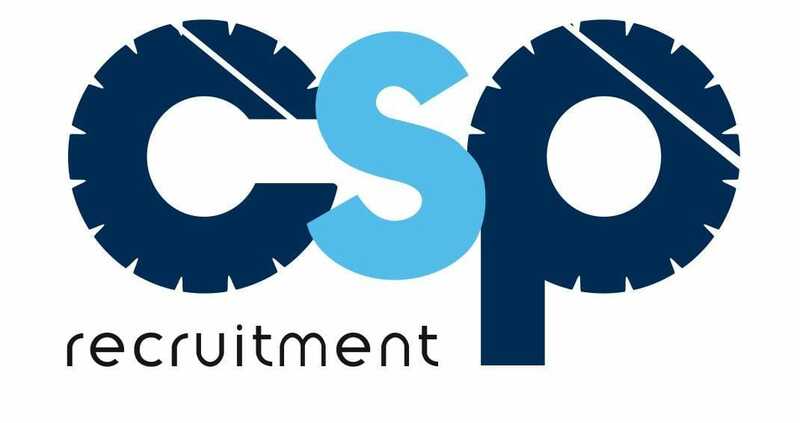 Senior player Kim Walton and Leicester City Ladies first team manager Matt Cook were also present at the training session held at Station Road in Quorn to spread the work of Leicester City Ladies and girls football. Numerous girls have taken contact details and are looking to join the club after having a great time at the training session. With a slight change in formation Leicester City Ladies went in search of their first points of the season. Leicester City Ladies started this game on the front foot with Jenna attacking down the left and Beth down the right, as the half wore on the ball was played into Olivia’s feet on the edge of the Rugby penalty area where she turned and fired home to put Leicester 1-0 up. Eleni and Jodie defended strongly against a lively Rugby attack to keep the scoreline 1-0 till half time. The second half started with Leicester City Ladies attacking on the left with Natasha having a run at the Rugby defence but her cross could not pick out a Leicester player in the box. Then Olivia and Keely had chances to put Leicester City Ladies further in front but were kept out by some great saves by the Rugby goalkeeper. Against the run of play Rugby equalised after some head tennis in the Leicester City Ladies area saw the ball fall to the Rugby player who slotted the ball into the net. Both teams then went to try and find a winner as the game flowed from end to end, Leicester City Ladies attacked down the right the ball was crossed into Shelby who found the back of the net from inside the penalty area. Olivia then got the ball just inside the Rugby half and ran toward the Rugby penalty area brushing off the defender then shooting home to make the score 3-1. Rugby battled straight back and went forward with a cross to the far post where the striker scored from close range 3-2. Rugby were then denied an equaliser as a goal bound effort was cleared of the line by Olivia. With some no nonsense defending from Emily and Beth and some good handling from Megan the Leicester City Ladies side held on for their first win of the season. Leicester City Ladies squad: Megan, Eleni, Keely, Natasha, Jodie, Emily, Olivia(2), Jenna, Beth and Shelby(1). Player of the match Olivia, scored 2 goals and a goal line clearance, strong at both ends of the pitch. The first round of the League Cup gave Leicester City Ladies a tough task by drawing Wolves at home, but a spirited display left the match level at three goals each after extra time. With Wolves progressing to the next round on penalties in an excellent cup tie. Leicester City Ladies took the lead through Walton at a set play and this proved to be the only goal of the first half. Leicester City Ladies started the second half slowly and credit to the away team as they scored two goals to lead the match just before the hour mark through two well worked moves. Wolves could have been further ahead but Catt in the Leicester City Ladies goal saved a penalty. Leicester City Ladies managed to get their game back together and a fine free kick from Scott levelled the game. Extra time opened with torrential rain and hail and after seven minutes Wolves took the lead with the best goal of the game, a twenty yard curling effort in to the top corner. In the second period of extra time Walton levelled the scores again as Leicester City Ladies showed great character. The match came down to the dreaded penalty kicks and Wolves ran out 5-4 winners as the Wanderers keeper pulled off a great save amongst some great kicks from both sides. Overall a draw was probably a fair result but one team has to go through and it was a great cup tie for the neutral. This opening game of the new season proved a tough opener, in what was Leicester City Ladies(2010) first competitive fixture. The Leicester City Ladies side were holding their own until midway through the first half when Oadby & Wigston took the lead with a spectacular volley from outside the area. Shortly after going behind Leicester City Ladies had the chance to draw level with a quick break but Olivia shot narrowly wide. As the second half got underway the Oadby & Wigton team started to create chances which Megan in the Leicester goal dealt with until an Oadby & Wigston player found space in the area to score. The Leicester City Ladies team pushed forward but found it difficult to create chances against a strong Oadby & Wigston team. As time was running out Oadby & Wigston put a cross into the Leicester City Ladies area where an Oadby & Wigston player unmarked slotted home to make the final score 3-0. The Leicester City Ladies team showed great effort and commitment keeping going till the final whistle. Leicester City Ladies squad Megan, Eleni, Keely, Natasha, Jodie, Emily, Olivia, Jenna, Beth and Shelby. Player of the match Megan, confident début from a brave goalkeeper who showed safe handling throughout this match. Leicester City Ladies travelled to Copeswood and picked up a point in an amazing five all draw. Two goals from Ball and one each from Hiller, Bateman and Kilby earned a patched up Leicester City Ladies a point, scrappy defending gifted Copeswood goals but with the Leicester front line playing well it was a very up and down game. This strange game was overshadowed by injuries most notably to Leicester City Ladies captain Erica Kilby, who we wish a speedy recovery. Player of the Match: K.Hillier. Leicester City Ladies under 18s are looking for additional players for this season. In this midweek local derby Leicester City Ladies and Loughborough Foxes shared the points . Loughborough Foxes went into the lead through slack Leicester City Ladies defending before Ball and Bateman linked well to level the match. The second half was all Leicester City Ladies but a series of good saves from the Loughborough Foxes keeper and a missed penalty meant it was not to be and the teams picked up a point each. 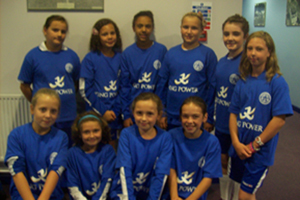 Leicester City Ladies (2010) under 12s had the honour of being player escorts for the Leicester City v Southampton match played on 27th August 2011. 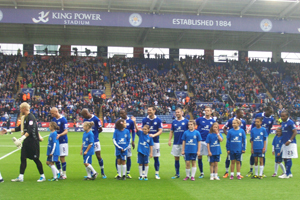 In a memorable day for both the girls and their parents the team walked out with the Leicester City side as they took to the King Power Stadium pitch for the game, which they went on to win 3-2. Thanks to all the parents for their support, and would like to say all the players that took part were a credit to themselves their parents and the club. Leicester City Ladies Lions got off to a flier in the u-14 section of the girls league beating Cosby United 17-1. Goals from “CC” six, Lacy and Georgia both getting hat tricks, two each for “Mopps” and Jamie with “Minty” also scoring. 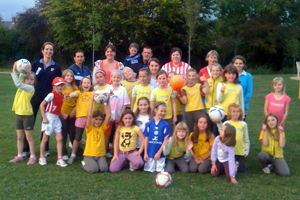 Leicester City Ladies Team; “Mini”, Sophie, Shakeela, Beth, Chloe, Jamie, Lacy, “Minty”, “Mopps”, “CC” and Georgia. Leicester City Ladies secured their first points of the season with a 4-2 victory over newly promoted Dudley United Ladies. Leicester City Ladies got a shock as Dudley United Ladies raced to a two goal lead at Aylestone Park. Just before the break a goal from Hillier brought Leicester City Ladies back in the game. 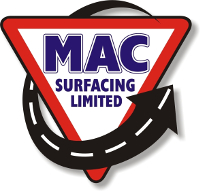 In the second half it was one way traffic from Leicester City Ladies with three unanswered goals from Walton, Scott and Brant rounded off the first victory in this seasons league campaign. Overall it was a convincing win for a Leicester City Ladies team featuring nine new players, not only to the squad but football at this level. Player of the match – Helen Rudkin.